On the screen I can see how the already ugly and scary villain goes through metamorphoses due to an allergic reaction to cheese. His face is twisting and turning into a formless mass that would make Frankenstein look cute in comparison. And yet this is a mild care compared to what’s to come further on. There will be torture. There will be gruesome deaths in front of our eyes. There will be gigantic robotic death machines controlled by evil creatures. 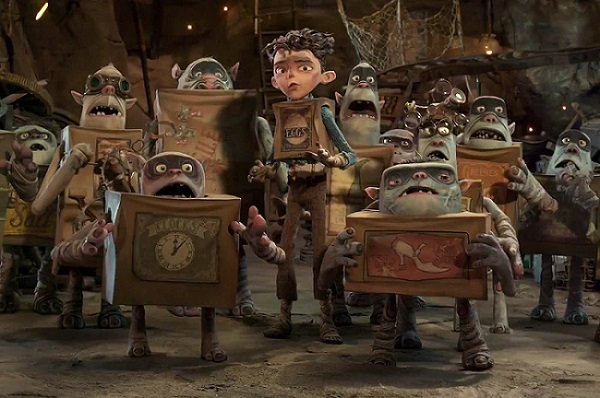 The Boxtrolls is ghastly, grotesque and gorgeously looking movie made with classical stop motion animations, made in a style that makes you think of Tim Burton or perhaps Terry Gilliam. The story goes like this: Cheesebridge is governed by a cheese loving aristocracy. In the sewers dwells a population of a certain kind of trolls, which like to dress in empty boxes. The trolls are oppressed in the worst possible ways and there’s even an exterminator who is trying to evaporate them altogether. Among the trolls lives a human boy who is trying to save the box trolls by the help of a girl who is the daughter of one of the cheese aristocrats. As you here it’s not terribly complicated, which is a good thing, especially for a movie aimed at children. Trying to explain the plot whispering in the ear of your clueless child is not a pleasure, neither for the child, nor for everyone around you. In this case there’s no need for explanations. We “get it”. As opposed to many other movies for young audiences, it doesn’t have “merchandise sales” written all over it. It’s possible that some kind of toys exist, but it-s clearly not the sole purpose for making the movie. It’s not a vehicle. Thumbs up: for the uninhibited use of imagination and the craftsmanship and love that has gone into the making of it. You can tell. It’s just beautiful. Thumbs down: for watching it in Swedish with dubbed voices rather than in the original English. We did it for scheduling reasons, but I hit myself when I saw what actor voices we missed, including Ben Kingsley, Elle Fanning, Nick Frost and Simon Pegg. Gah! Don’t do my mistake. Watch the original. And whatever you do, don’t miss: the delicious little extra scene that comes after the text credits. It’s worth waiting for and made me love this film even a little more. Haha, that’s lovely! I didn’t see much reactions around me, but you seem to have found a more lively spot in the theatre. As long as they don’t shower me in popcorn I’m fine! To be honest the Swedish voices didn’t bother me, but, yes, I would have preferred the original. Good point about the feeling that it’s made for the kids’ enjoyment rather than their money. It’s refreshing. It is! I would love to see more of that kind of childrens movies: franchise free. I agree with Carl! Although I can enjoy the content more in, say, a Pixar-movie it was a relief to watch something that didn’t appear on every damned thing in the sweet shop outside the theatre. Yep. This said: Pixar has made some truly lovely movies. But I still think it’s a good sign when an animated movie doesn’t appear as Mc Donald toys. Nice post. I cannot wat to see this one. It has opened here in Mexico but dubbed in Spanish! AARGH! Doh. I still think you should grab it. I saw it dubbed in Swedish and still enjoyed it a lot. One can definitely go on one’s own!